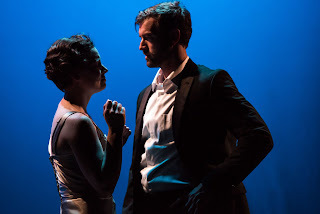 The 2015 Torch Theater/Gremlin Theatre season at the Minneapolis Theatre Garage* continues with the first all-Gremlin production, after the joint production, the dark and disturbing Death and the Maiden, and Torch's perfect screwball comedy Boeing Boeing earlier this year. 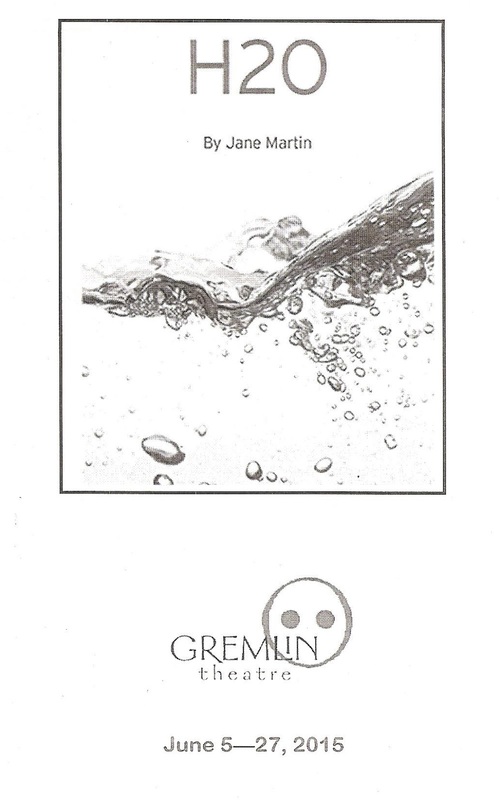 For their production Gremlin is tackling H2O, a new play by Jane Martin (most likely a pseudonym for Jon Jory, Artistic Director of the Actors Theatre of Louisville). In the capable hands of director Ellen Fenster (who has made me cry on more than one occasion) and a couple of compelling three-named actors, Peter Christian Hansen (Gremlin's Artistic Director) and Ashley Rose Montondo (most recently seen as a girl who cried witch in The Crucible at the Guthrie), this intense 90-minute two-hander is a funny, painful, and engaging story of fame, faith, and art. This is the story of Jake and Deborah, about as opposite as two people can be, and both actors bring out the best (and worst) in their characters with a believable, if ever-changing, chemistry. Jake is the benefactor (or victim) of the quick and absolute kind of fame that happens often in the media age. He was cast as a superhero in a series of movies, but doesn't feel worthy, so plans to prove his worth (mostly to himself) by playing Hamlet on the Broadway stage. Deborah is a young NYC actor who believes that acting is her calling, because Jesus told her so. Raised and schooled by her father in the church he founded after receiving a similar calling, Deborah is a woman of principles, determined to live by them, with a series of strict rules about what is and isn't OK in her career. Jake is disgruntled with the idea of acting, while for Deborah it is her life's noble purpose. When these two people are thrown together due to a tragic event, their worlds collide. Jake convinces Deborah to be the Ophelia to his Hamlet, and the two embark on a friendship that is at first good for both, expanding their worldviews, but then takes a dark turn when Deborah won't give Jake what he wants. Deborah does as much as she can to save Jake, but he is unable to take that extra step and save himself. Spoiler alert: this one doesn't have a happy ending. If I may compare this play to a TV show, Jake and Deborah's destructive relationship reminds me of the relationship between Chris and Sister Pete on HBO's brilliant ahead-of-its-time prison drama Oz. In a memorable scene, Sister Pete tells Chris "we don't choose God, God chooses us," and Chris raises his hand to the sky with a desperate look and says "pick me!" Like Jake, Chris is full of self-loathing and desperate to be rid of it, desperate to be saved by someone, not realizing that he needs to save himself, and unable to do so. 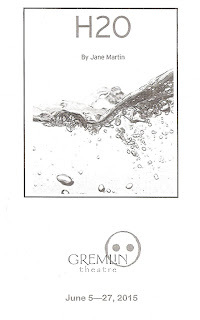 The title of the play, H2O, has several meanings. Firstly, Hamlet to Ophelia. Not a good relationship after which to model one's own, but Jake and Deborah's relationship does follow the slow descent into madness of these characters. H2O is also the chemical formula for water, a theme that appears often in the play, as does actual water (this is a messy one, figuratively and literally). Water is a symbol of life, used in religious ceremonies. Which brings me to another theme of the play, faith. The character of Deborah is at times infuriating, at other times exhausting, with her strict and unforgiving relgious belief and her insistence that Jesus speaks to her. But I also found her to be smart, funny, modern, and likeable, struggling to marry her beliefs with the messy real world. Lastly the play explores the idea of fame, especially fame that comes too easily and too quickly. The insane pressure that we put on our celebrities to be a certain way or act a certain way is often too much to bear, and the story of a famous actor or musician who succumbs to self-destructive behavior is all too familiar. The many scene changes and set changes are handled smoothly by the cast and crew, including four "essentials" who are sort of a mix of both. Dressed in black, they move furniture on and off stage quickly and efficiently, and also serve as extras in some scenes, wordlessly interacting with Jack and Deborah, providing a blank wall for them to react to and bounce off of as they deliver their monologues. The stage is completely bare, with just a few key set pieces brought out when needed (set design by Carl Schoenborn). Katharine Horowitz's sound design helps set the scene in the various NYC locations. H2O is a challenging play, both to stage and to watch, with its depictions of violence and an unhealthy relationship. It's not for the faint of heart, but is, as per usual with Gremlin Theatre, very well directed, acted, and produced. H2O continues through June 27 (find half-price tickets on Goldstar). *The final production in the Torch/Gremlin/Garage season will be another joint production TBA.